Yesterday, Nokia announced the sale of its handset division to Microsoft, bringing the the brand's five-year decline to its inevitable conclusion. The timing was fitting. Just last month, industry analysts at Gartner announced that global smartphone sales had officially overtaken dumb-phone sales. And the story of Nokia's fall is also the story of the smartphone's rise. Nokia's share of the worldwide mobile market peaked at 40 percent in 2008, the same year that iPhone sales truly began to soar, and not long before Samsung debuted its first Android device. Despite an impressive history of innovation—it was a pioneer in wireless infrastructure, was perhaps the first company to transform cell phones into fashion accessories, and actually created the first smartphone back in 1996— Nokia never really successfully transitioned into the new age. There are a litany of reasons for why that have to do with the nitty gritty of corporate management and strategy (a big one: management miscalculated that it could survive largely by selling dumb phones to the developing world). But the biggest problem was simpler: Nokia was a phone company in a world that had stopped buying phones. Instead, we buy small computers that can also make calls. Before Steve Jobs & Co. effectively rethought the industry, smartphones were still essentially communications devices. They could call. They could text. They could moonlight as "email machines," as Microsoft CEO Steve Ballmer put it. And, yes, they had cameras. But while they could access a bare-bones mobile version of the Internet, and sometimes came with bells and whistles like GPS or FM radio, much as Nokia's own N95 did in 2007, they still basically belonged to the genus "cellular phone," descendants of those first enormous bricks bankers carried around in the 80s. The iPhone evolved differently. It was a mobile phone, yes, but it was a device created with the explicit intent of syncing with iTunes and other Apple computer apps. In spirit, its form and function descended as much from the iPod as much as any phone that preceded it. * It could access actual web pages. And once the second generation 3G model debuted along with the Apple app store, owners suddenly found themselves with a seemingly limitless range of software a few finger swipes away. Today, as John Gruber succinctly observed on Daring Fireball, "cell phones are apps, not devices." Apple was able to pull off this revolution because it was a rare breed: a computer company equally devoted to hardware and software. Nokia, as James Surowiecki points out at the New Yorker, was a hardware company that never fully grasped the software business. Its early smart phones ran on Symbian, a third-party operating system first designed for PDAs—remember those?— that lacked the elegance or flexibility of Apple's iOS. 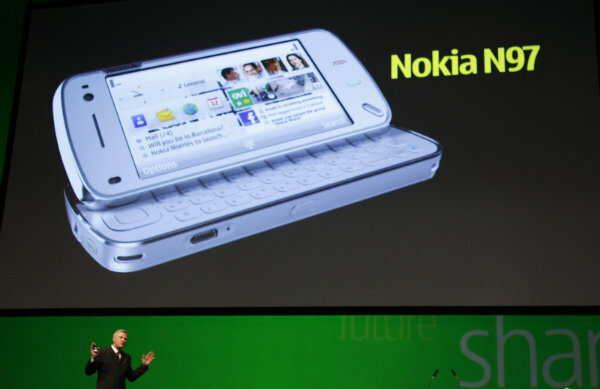 Its attempt to buy Symbian and revamp it fell flat, and by the time Nokia moved its devices to Windows, it was too late. Had the company realized its own limitations, perhaps it would have survived. The world's leader in smartphone sales, Samsung, did relatively little in the way of innovating, at least at first. Rather, it borrowed liberally from Apple's innovations in form, while relying on Google's Android platform, which drew heavily from Apple on function. And largely by beating Apple on price, it's taken over the world market. Nokia was a very smart phone company and a very dumb computer company. That why, today, it's barely a company at all. *Correction: this article originally stated that the first generation iPhone came with a hard drive. It ran on flash memory.